It’s that time of year again. Yup, that jolly, happy time of year when the soothsayers of Wall Street start trumpeting their views on what’s going to happen in 2015, and how to position portfolios to profit. Esteemed Wharton professor, Jeremy Siegel, author of the permabull bible, Stocks for the Long Run, recently joined the merry parade with his own forecast that Dow 20,000 ‘could happen’ in 2015. Astute investors might take stakes now in large manufacturers of confetti, party horns, and streamers. But I digress. We don’t make predictions on this blog, but it is constructive to understand generally what the range of probable outcomes might be. Is our hero, Dr. Siegel, taking a brave stand against the bearish hordes, or is he making safe proclamations from behind a sturdy statistical moat? We aim to find out. First, the low hanging fruit. What is the unconditional probability that the Dow Jones Industrial Average, which currently sits at approximately 18,000, closes out 2015 above 20,000? First, let’s assume that returns are normally distributed and iid. Next, let’s take long-term average (arithmetic) U.S. stock returns to be 5.3% per year (this is the average 12 month arithmetic price-only returns to U.S. stocks from the Shiller worksheet – remember, index returns do not include dividends), with annual standard deviation of 20%. So the unconditional probability that the Dow closes at 20,000 or greater at the close on the last trading day of 2015 is almost 40%. This is not quite a coin toss, but Jeremy is not exactly going out on a limb. 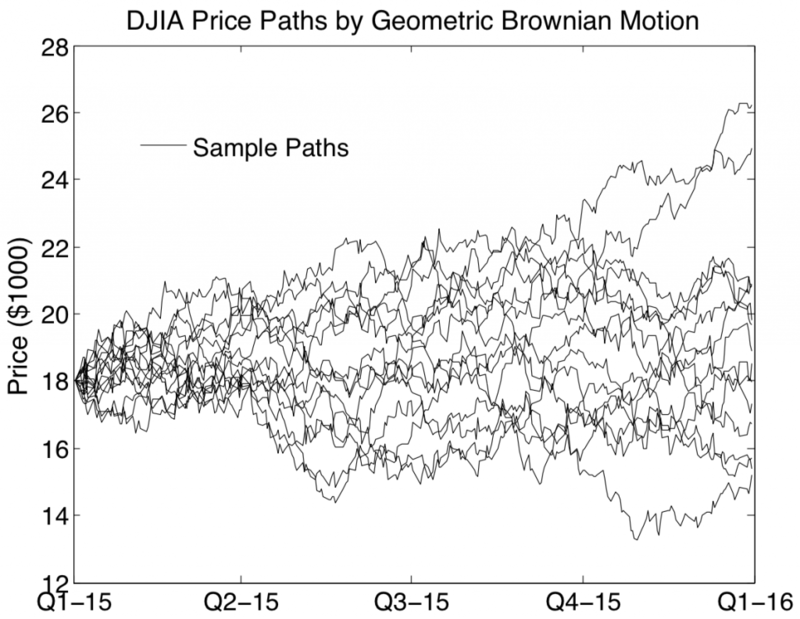 Keep in mind that stock market price returns approximate a geometric random process. They don’t just climb in a steady curve, and close each day at a new high. Surely Jeremy would take credit for his “Dow 20,000” call if the index exceeds the magical 20,000 threshold at any point during the year, even if it doesn’t actually finish the year above this level. For simplicity however, let’s just examine the probability that it closes above 20,000 on any trading day of the year; so we won’t take into account intra-day periods. Were the Dow to close at 20,000 on trading day 1, that would represent an 11.1% return in 1 day. Given the 1 day expected return is 0.02%, with a 1 day SD of 1.26%, this would be a (0.111 – 0.0002) / 0.0126 = 8.8 standard deviation event. The probability of a positive 8.8 sd event under a normal sample distribution is a decimal number preceded by 20 zeroes. Essentially no chance. But that’s just on day 1. What about on day 63, which is about 3 months into the year? The expected return after 63 days is 1.053^(63/252)-1 = 1.3%, with a standard deviation of 20% * sqrt(63/252) = 10%. Were the Dow to have risen 11.1% to close at 20,000 on trading day 63 (about the end of March), that would represent a (0.11 – 0.013)/0.1 = 0.98 standard deviation event. The probability of a positive 0.98 standard deviation event is about 16.3%. Now are are talking a 1 in 6 chance that the Dow hits 20,000 at the end of March, the same odds as throwing a 6 on a standard die. The following chart was formed by performing essentially the same analysis at each daily period, and shows the probability that the Dow will meet or exceed 20,000 at the close of each sequential trading day of the year. We highlighted the 16.3% probability at a 3 month horizon described above for illustrative purposes. We now know the probability of the Dow closing above 20,000 on any given day, but we still haven’t answered the question, “What is the probability that the Dow closes at or above 20,000 at any time in 2015?” To answer this, first consider Figure 2, which shows just 20 of the virtually infinite number of possible paths for the Dow over the next year, given our mean return and standard deviation assumptions. By visual inspection we can see that a substantial portion of the potential paths in Figure 2 cross above 20,000 at some point during the year. 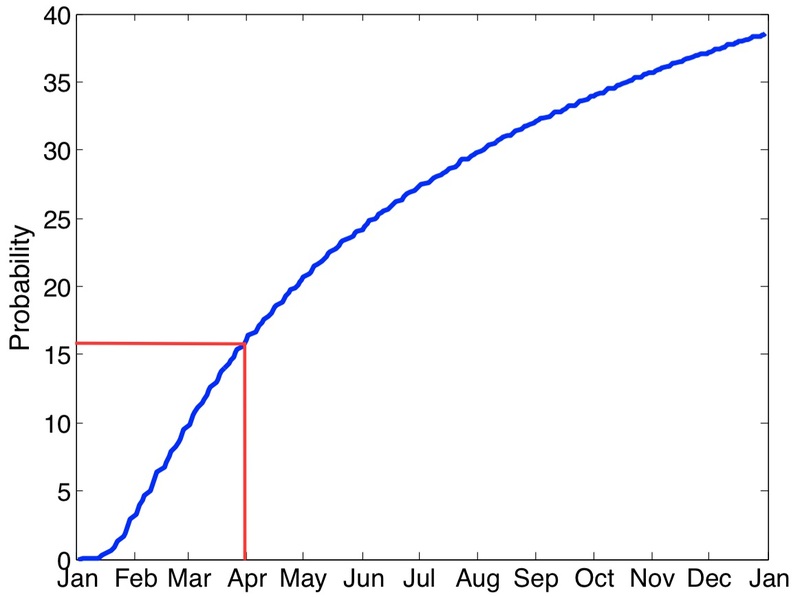 We ran a Monte Carlo simulation of 1 million possible paths, and discovered that about 64% of paths would cause the index to rise above 20,000 at some point during the calendar year. Particularly astute readers may recognize that the former problem, where we solved for the probability of a price exceeding a specific value at a certain point in time, is a problem of similar nature to that of solving for the value of a European call option, which can be exercised only at expiration. This problem has a known closed-form analytical solution. In contrast, the latter problem has elements that are similar to finding the value of an American call option, which can be exercised at any time up to and including expiration. This problem has no known closed-form solution, and must be solved numerically or by simulation, such as our Monte Carlo method. It’s critical to understand the random element in stock market activity so that we don’t get so emotionally attached to silly milestones. There is a 64% chance that the media and the top 0.01% will be able to break out party hats and champagne this year to celebrate an arbitrary milestone in a poorly constructed index. Siegel isn’t making a bold statement; far from it. Rather, he is playing the (unconditional) odds. And that is precisely what you should do as an investor. The question is: do you feel lucky? We can think of a few reasons why you shouldn’t feel so sanguine, and might humbly suggest a better way of thinking about markets anyway.